On May 18, a massive Magnificent Jewels sale is scheduled to take place at Christie's in Geneva. Among the pieces up for auction will be a collection of jewelry belonging to Gabriele zu Leiningen, who has connections to two royal families. Gabriele Thyssen earned a doctorate in international law and worked as an attorney before her marriages. In 1991, she wed Karl Emich zu Leiningen, who is a descendant of German, British, and Russian royal families. They divorced in 1998, and later that year she married the Aga Khan IV. As a part of that union, she converted to Islam and adopted a new name and title: Begum Inaara Aga Khan. The couple agreed to a divorce settlement in 2014. Many of the jewels being sold at Christie's date from Gabriele's second marriage. 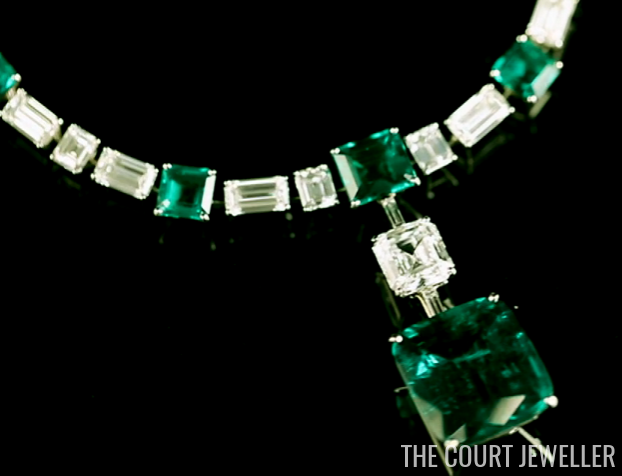 Above, a Cartier necklace of emeralds and diamonds, with a large Colombian emerald pendant measuring more than 39 carats. The auction estimate for the necklace, which also has a coordinating pair of earrings, is between $2.5 million and $3.5 million. 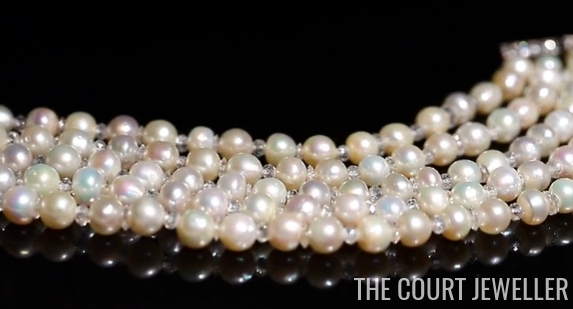 Gabriele's five-stranded pearl necklace, pictured above, features diamond bead spacers between each of the natural pearls. 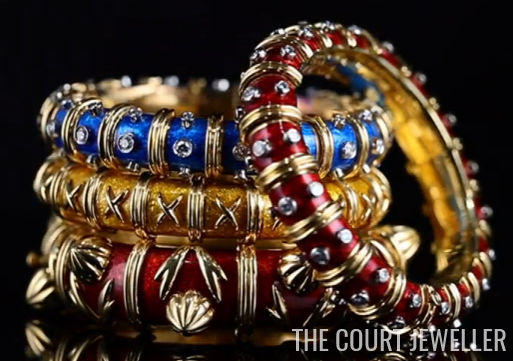 This set of enameled bangle bracelets was made by Jean Schlumberger. 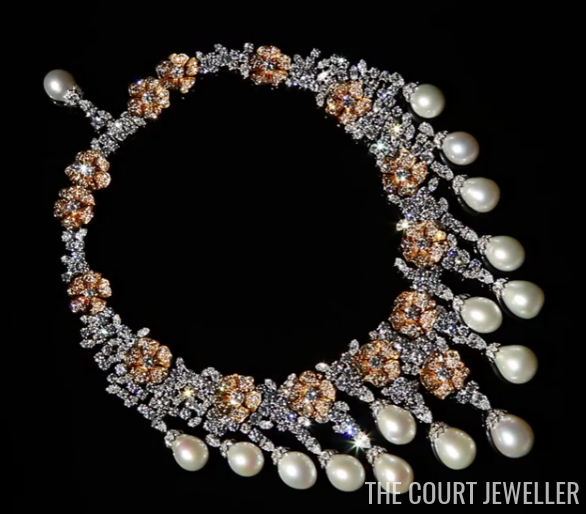 This diamond and pearl fringe necklace, made by Van Cleef and Arpels, was owned by the Begum Om Habibeh Aga Khan, the French-born fourth wife of the Aga Khan III. Another Van Cleef and Arpels treasure from the collection: a suite of diamond and ruby jewels made using the house's famous mystery setting. Gabriele is also selling an important gem: the Pohl Diamond, which weighs more than 36 carats. The diamond is set in a ring; it was purchased from Cartier for Gabriele in 1998. 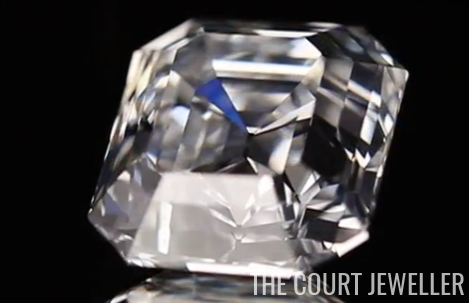 Christie's is estimating that this diamond alone could sell for as much as $5.5 million. 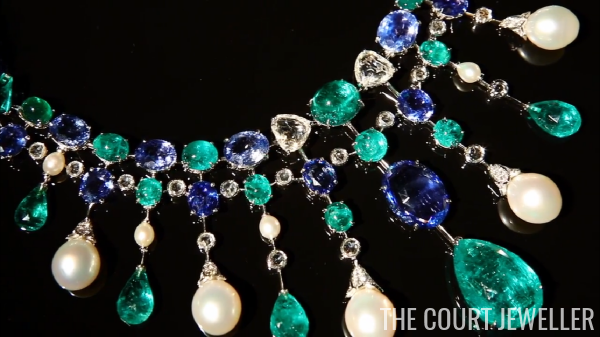 The images in this post don't really do justice to the gems; you really need to head over to the Christie's website to see a video of the pieces in motion. 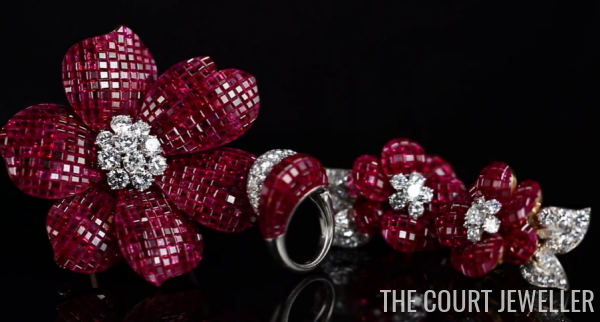 The video is accompanied by more information about the jewels from Rahul Kadakia, the auction house's International Head of Jewelry. Head over and drool over these pieces and more! Oh, and one more thing -- there will also be a piece of Queen Victoria's jewelry up for sale at this auction. Above: a tease from Vincent Meylan, who recently wrote about the ruby and diamond brooch in Point de Vue.